The shorter of the two 1100s is an LGW exclusive design, the "18-8." 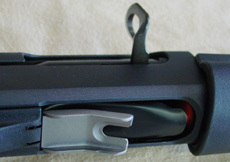 Starting life as a Remington 1100, the vent rib barrel was shortened to 18½-inches and a custom-made magazine tube was added for eight (7+1) rounds capacity. Offers unprecedented reliability and ease of handling. With the rest of LGW's custom modifications, that little fella would spit fire from the ports and command spectator attention during the Rolling Thunder portion of bowling pin matches! Eight fired hulls in the air simultaneously tends to draw people's interest! "If I had to shoot a practical match in Britain or elsewhere tomorrow and could take only one gun, I'd use the LaRocca...."
"LaRocca's Practical Shotguns are winners - both in Practical Shooting competition and for self defense!" "This 870 is fantastic!! I can't believe how smooth it is and how much the recoil is tamed."